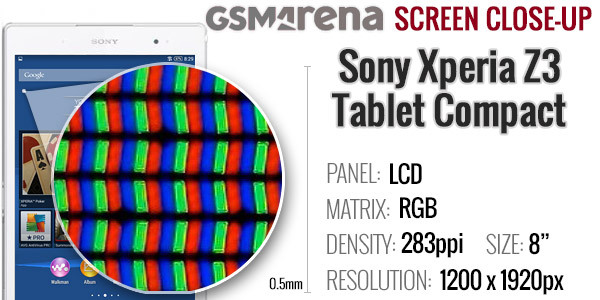 The Sony Xperia Z3 Tablet Compact features an 8" Triluminos display with 1,920 x 1,200px resolution (aka WUXGA). The Triluminos tech promises a wider color gamut than conventional LCD screens, especially better reds and aqua green/emerald colors. The colors are indeed impressive - the default live wallpaper cycles between different colors to show off the screen and it works, the impressive reds in particular are something to see. A white balance setting lets you tweak the screen though we would have liked a saturation slider here as well. Viewing angles are as wide as is practically necessary, though contrast varies noticeably depending on the angle of view so shaking the plane of the screen a bit has the potential of getting you dizzy. The screen does not use an IPS panel, but when you view it head on it looks really good. Putting the brightness slider at its top position confirms Sony's claims that this is its brightest LCD yet. For inside use we kept the slider at 80% or less as there was no need for the extra brightness. While not the brightest LCD in general, it's one of the brightest tablet screens around. Outside with the sun reflecting off the screen there's definitely more use for the highest settings of the brightness slider. The glass is on the reflective side though, which hurts sunlight legibility. Note that there's an ambient light sensor so the Xperia Z3 Tablet Compact can change the brightness automatically. Also, Smart backlight control will prevent the screen from sleeping while you are looking at it. We mentioned colors, but the other half of the image quality equation is sharpness. The 8" display has 283 pixels per inch, compared to 324ppi for a Retina-packing iPad mini and 359ppi for the Galaxy Tab S 8.4. Close to 300ppi is generally quite enough for tablet use (you hold the bigger screen further away) though it's possible to notice some imperfection in sloping curves of on-screen icons. If your eyesight has gone the other way and it's no longer good enough to spot such tiny pixels, you can use the Font size setting to make text bigger. Two other helpful options in the Screen settings are Glove mode (which boosts sensitivity) and the double tap to wake option (so you don't have to reach for the Power key). The Sony Xperia Z3 Tablet Compact has a rich set of connectivity features. There's a Wi-Fi only version but if you need Internet access on the go you can grab the LTE-enabled variant. It starts off with 2G GSM connectivity goes through 42Mbps HSPA and offers Cat. 4 LTE for up to 150Mbps of download speed and up to 50Mbps for uploads. There's a variant with TD-LTE for the Chinese market. There's voice call support on the LTE version, while on the Wi-Fi only tablet you'll have to rely on VoIP solutions (Skype, Viber, you name it). If you don't buy an LTE-enabled tablet, you can use Xperia Link to share your Xperia phone's Internet connection with the tablet via Bluetooth (instead of the more power-hungry Wi-Fi hotspot). 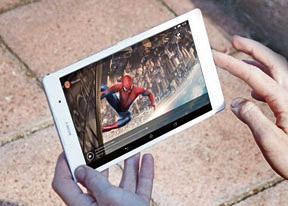 In terms of local connectivity, the Z3 Tablet Compact has dual-band Wi-Fi a/b/g/n/ac to lean on with DLNA and Miracast functionality. There's also Bluetooth 4.0 LE complete with the aptX audio codec. ANT+ is also available though the chances of using sports accessories with a tablet are pretty slim. For easy pairing (part of Sony's One-touch connectivity) there is NFC - you can pair with Sony devices like smartwatches, headphones and even TV remotes. Besides Miracast, there's MHL 3 available on the microUSB port. It can stream 2160p video at 30fps with 7.1 surround sound so if you pair the Xperia Z3 Tablet Compact with a high-end TV you can have quite the viewing experience. Sony's Smart Connect app comes pre-installed. It allows you to set your device to do a variety of things - like launch an app or set an alarm - whenever you connect an accessory like a headset or a charger. You can also set events to occur during a time interval (e.g. mute alarms at night). As for NFC compatibility, the Smart Connect app doesn't work with ordinary NFC tags, but only Sony's Smart tags, which is kinda disappointing. However, one of our readers duly pointed out, you can purchase cheap generic NFC tags, which are programmed as SmartTags so the app can recognize them just fine. If you're experiencing connectivity issues over Wi-Fi you can use the Wi-Fi checker tool, which is similar to the tool on Windows (and like it, it probably can only confirm there's an error, the rest you have to take up with your router and Internet provider). The Sony Xperia Z3 Tablet Compact has a 4,500mAh battery - not bad considering how thin it is, but the 6.6mm thick Galaxy Tab S 8.4 has a 4,900mAh battery and there have been 6" phablets with 4,000mAh batteries. 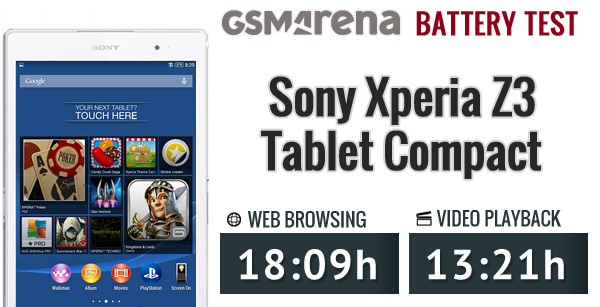 Still, Sony has demonstrated great battery life from the other two Xperia Z3 devices. The web browsing score is particularly impressive, lasting over 18 hours. The video playback time is less - about 13 and a half hours, somewhat below the official 15 hours Sony gives it. Keep in mind we test the video players until the battery hits 10% as we've had issues with players automatically quitting when the battery gets this low and we need to keep things level. You can read about how we perform the battery test if you want to learn more.